First again: Sorry to hear about Anton, it must have been a shock for all concerned. Looking forward to the question each month on the ISWG. Am I really first? I haven't yet but will see Fining Dory. Love the idea of questions for IWSG. I didn't think The Conjuring 2 fell short of the original. I personally thought it was almost on par, and although not exactly as terrifying as the first one, it actually managed to deal with more, as it had more elements in its script. A Member of Parliament was murdered here last week - she was a rising star of a Leader in this world ... so very sad. Now I must see Finding Dory. I loved the first movie. I'm too scared to see The Conjuring 2. The movie poster alone gives me the heebie jeebies. I had been wondering about Conjuring2, may give it a try now. Sad news about Anton. Congrats to all those with new releases. Glad you liked Finding Dory, even if it was kind of like the first movie. Sounds like a great idea to pose questions people can answer for IWSG posts. Can't wait to take my grandson to see Dory!!! I liked the Conjuring, hoping to see the sequel. I was shocked and saddened to hear about Anton. So young! Plenty of atrocities happening lately. Take Care! And have a good week. Alex. Sorry, No Conjuring movie for me. I have enough paranormal activity in my real life to deal with. I'd have nightmares and to those I am not a fan. Of course I am picking up Pat's new book and one from Crystal that she recently released. Have a great day Alex! Did you get a chance to see the moon last night? It was absolutely glorious. Beyond the Stars is full of wonder. Both the grandees have seen Finding Dory but gramps has yet to see it. IWSG with some innovative ideas will prove to be useful, certainly. Congrats on the new releases and am glad Pat is seen again. I'd like to see The Conjuring 2. I liked Vera Farmiga's work in Bates Motel. Thanks for the review and enjoy your week, good buddy! That's such awful news about Anton. What is it with 2016 and celebrity deaths?! Finding Dory sounds like it would be worth seeing, even if my son hasn't seen Finding Nemo yet. I created a page on my blog called "For AJC" and pasted the post into there. Sorry you have to go through so much trouble for this! I'd like to see Finding Dory; I loved Finding Nemo, and the only trivia I knew was Bishop. Phew, 100 books. That is a lot. Congratulations Pat. I have Finding Nemo, maybe I should check out Finding Dory. I think the idea of a question is excellent. It is often difficult for people to find something to talk about. Can't wait to see The Conjuring 2! Watched the first one again this weekend - it was so good! Congrats to all the authors with new books! 100 books written by Pat? Wow! Congratulations! Yvonne, it was really tragic what happened to Anton. Hilary, I read about her death. All because of some nutbag. Truedessa, I did see the full moon last night. Heather, been too many of them. Sandra, I'll be right over to get it. Madeline, be funny if you missed it! Oh, that's a great idea with the month question for IWSG. It can be hard to figure out what to write ;) My kids are looking forward to Dory--the older ones. The younger ones don't care so much, but my teenage daughter says that's because it's a film for 90's kids. Oh my goodness, thank you! I was just thinking the other day: Should I ask Alex to post my book on his blog? And you've already done it. Smiles. I'm pretty sure my family will be going to see Finding Dory. I told the kids I'd like to wait a bit until the crowds die down so we can enjoy good seats. As for The Conjuring 2, I'll have to wait for Redbox, since I'm the only one in my family who likes horror movies. Shaking my head, as I knew the answers, except 1 and 4, never would have got them. Thanks for the shout too! I was really sad to see the news about Anton yesterday. It will be hard watching him in the Star Trek movie this July, knowing he is gone. I haven't seen either of those movies. Adding a monthly question to IWSG is great. It will help out when people can't figure out what to write about. I loved Finding Nemo and your reviews of animated films are much appreciated. Sad to hear about Anton. I'm looking forward to seeing Finding Dory. Congrats to all the new releases! And 100 books — wow, just wow. I like the idea of the IWSG question. I'll have to give that one some thought. I got two of the trivia questions right. Yay! Happy Summer Solstice! Kind of thought "Dory" would be a similar theme but it looks good. Just can't do the "Conjuring" type movies, but nice to hear it's a good show. So many aren't. Cool idea with the IWSG questions . . . looking forward to answering! I can't wait to see Dory. It looks like a lot if fun. A lot of great books have come out lately. I'm really looking forward to IWSG Day. I was very sorry to hear about the new Chekov dying. Such a freak and senseless accident. I was so sorry to hear about Anton. He was so young and it seemed he had a wonderful, shiny future. I know I'd enjoy seeing Finding Dory and I love the idea of a question a each for our IWSG post! T, it's fun for the 90's adults as well. Tamara, you're welcome! Always happy to feature my buddies' books. Karen, it would change things, wouldn't it? Charles, it was a really freaky accident. This past week-end we watched The Pride and The Passion which is about 60 years old so that gives you an idea where I am in my movie watching. I'd seen it a few years ago though so it was a rewatch. In all fairness though, we did also watch 13 Hours, the film about Benghazi so we aren't all that stuck in the past. I doubt whether I'll be watching the fish movie unless my grandkids are watching it sometime when I'm around. Not my type of movies, picked up some second hand books though! 100 books for Pat - that's awesome! I like the idea of including a monthly question in IWSG posts. I'm going to see Dory because my kids want to see it, but seeing that they're doing the same movie over again has made me not be able to work up any enthusiasm about it. Pixar looks to have definitely given up on being "Pixar." The nun, just in the trailers, is enough to spook me and I probably won't see it...too scary but glad good wins over evil as I'm sick and tired that so many shows and movies seem to show a hopeless situation. I'm hearing nothing but good things about Finding Dory so that's good and it looks like fun. Well, I knew one right answer to the movie trivia. I like the question part of your IWSG post. People have said I am funny but also that I write quite well. Hank was definitely MVP! of Finding Dory. I thoroughly loved the show. Also, I was stunned by the loss of Anton this weekend. Man, how awful. The thing that hurts the most is that he was so young and full of potential. I don't know where on earth I was last Monday but I certainly missed a lot here on your blog! Thank you for catching me up on the news. I am so sorry about Anton Yelchin. This is such a loss. I must be the only person who didn't like Finding Nemo. I really can't stand road trips (even when they are underwater), starting with The Wizard of Oz. Therefore it isn't surprising that I plan to avoid this spin off of Finding Nemo, unless my son who loves movies as much as I do can convince me that it is worth watching. As you sound a bit "eh", it probably isn't going to happen. I don't really have any desire to find my way to Dory but The Conjuring 2 looks like something I might watch when it's out on DVD. And yes, so crazy what happened to Anton. Poor guy. Now I've been reading reports that the Jeep that killed him had a recall for that exact thing: a confusing electronic shifter that seemed like it was in Park but was actually in Neutral. Especially frustrating/heartbreaking if that was the case. The new IWSG feature is a great way to spice thing up! I'm looking forward to it. Oh no! I loved Chekov. I'm so sorry to hear that news. On a more cheerful note, I'm planning to take my nieces to see Finding Dory. I love to share Dory with the young ones in my family. 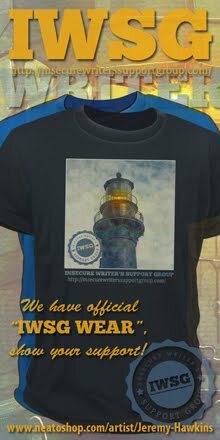 Looking forward to IWSG in July! Hubby and I were debating seeing Finding Dory. Pixar is good with sequels, but we are still wary. I said they didn't crank the sequel out, so that's good. 100 books? I can't imagine that many. Haven't seen Dory yet, but we probably will. The IWSG question is a good idea. I'll have to see if I actually remember to answer it when July comes around. Andrew, they used to be really good. Not sure what happened. Birgit, it was refreshing to see evil lose. Michael, yes he was. So tragic. Jean, even better since I'm not a father! Brandon and Bryan, that makes it even more tragic. Have yet to see Finding Dory, but this weekend we did see Cloverfield Lane. It was good, but I wasn't as blown away as I expected to be. As usual, I haven't seen any of the movies. The new books sound great, however. I prefer to read, maybe because I can stop when I want to and pick up where I left off. (Short attention span.) Where in a movie I can't. The IWSG question is a good one. I'm thinking. Really like the theme idea for IWSG--Sometimes I feel like I struggle with not getting repetitive. And I am looking forward to Finding Dory--trying to see if I can coerce my whole family into going. Finding Nemo is probably the last movie all four of us went to--hubs is super picky--he hates everything, but he loved that one. Planning to see Central Intelligence tomorrow. Finding Dory is coming to Jamaica on Wednesday and I'll definitely be seeing that. Congrats Pat! Um I think Rachel Morgan sent you the wrong book. A Faerie's Secret is book 4 and the one coming out today is A Faerie's Curse book 6. I would think that would be the book to promote today. Anyway another nice post Alex and have a great day. Love the idea of a question prompt for IWSG--always glad to have some inspiration! Was sorry to hear about Anton. Too many unnecessary deaths lately. Thanks for the info on Dory. My grandson is interested in seeing it and I wondered how it was. He's 8, so I think this will be right up his alley. I heard Finding Dory cleaned up at the box office. Probably not going to see it. I might be the only person in the world who didn't really like Finding Nemo. New IWSG feature should be fun. It is beyond tragic about Anton Yelchin. As always big congratulations to all those with new releases. And a big thank you to all authors too. Anton Yelchin's poor parents, God help them - he was their only son. His death is so tragic. They must be absolutely heart broken. I dare say Conjuring 2 will have a good turn out. Congrats to the authors with new releases. Those are 2 movies I'm looking forward to see. I've heard a lot of hype about the Conjuring 2, so I can't wait for that one. R.I.P. Anton Yelchin. So sad. I liked his movies. So sad to hear about Anton Yelchin - such a loss! Finding Dory sounds like it would be a worthwhile watch if I had a young one to take. My son's a bit old now, but I'll keep it in mind if my nephew visits. Adding a question or prompt to IWSG sounds like it will be a great way to help those of us who occasionally get stuck or repeat the same insecurity on a regular basis. I gotta remember to check in to see the question(s). It is 108 deg here today, so I imagine the theaters are packed with viewers hoping for a/c. It is a tragedy that such a young promising actor died so horribly. Praying for his family. Hello ninja. I'm certainly going to see Dory. I love those movies. I read about Anton's death last night. How tragic. I really liked him as Chekov. So sad.... Oh, and I forgot how to comment here. Don't close the window before clicking on Publish your comment button. Hmmm. I loved "Finding Nemo" and am still skeptical about seeing "Finding Dory" because it may let me down. "The Conjuring 2" is one of those movies I want to see, will be creeped out by, sorry I saw it, and glad I saw it, all at once. So glad to here that the newest adventure under the sea is entertaining, as Hannah and her Aunt, my sister, are going to see it tomorrow. Me and Pete will see it on DVD. I do not care for horror films in general. I like the old fashioned scary movies where you are scared, but no one gets hacked up in front of you. But I have watched many films about good vs evil. Good can always triumph if only the persons beset by evil will say, "I choose you, Lord." Even in death, evil can not win if we belong to Him! Praise God. Eh, I'll probably pass on both of those movies. I like the new IWSG feature! Cool new stuff with IWSG. The news about Anton Yelchin was heart-breaking. He was far too young to pass away. I very seldom see horror movies, but I saw the first Conjuring and want to see this second one, even though I'll probably yet again end up in a fetal position in my movie theater chair and watching the screen from between the fingers over my eyes. I saw The Conjuring 2, and while I enjoyed it, I agree with your assessment that it doesn't quite live up to the first one. That said, I was glad the actors who played the Warrens in the first movie all returned for the sequel, and that we got to know the Warrens a little bit more. If I had a problem with anything, it was the huge number of jump scares. In the special features of the first movie, someone praised director James Wan for never using horror to "fool" the audience. I guess Wan figured the second movie could use a lot more fooling. I think the new feature sounds great, btw. Sometimes I've been stumped on IWSG day, with no idea what to write. This should solve what I suspect is a common problem. A theme park just outside Madrid has some sort of Conjuring 2 interactive experience. Are they doing that in the States too? I was 'forced' to watch Finding Nemo so many times that I'm put off watching anything even vaguely similar, so I'll give Dory a miss, I think. Sad hearing the news about Anton. RIP Anton Yelchin I want to see the new Conjuring movie. I just finished reading a book that was part of my high school days and reading assignment years ago, Go Ask Alice. I found it at a yard sale. I read about Anton Yelchin. Too sad. I'm looking forward to seeing Dory, though I won't be rushing out. I did think the ads looked a lot like Nemo, but I could do that again. LOVE the idea for IWSG posts. I've been wracking my brain for topics lately. I'll appreciate the help! Tired plot aside, I'm pretty sure Finding Dory will be a HUGE hit. Hart, you guys are due for a movie then! Susan, that's all right. I'm the only one who didn't like Up. Kim, never too old for an animated film. JH, my wife certainly jumped a lot. Sean, if they are, I don't know where. I like the idea of having a question of the month for IWSG. That'll help any of us who are struggling with what to write for the monthly post, plus I think it should start some interesting conversations. Right after that actor's death was announced, someone posted a PSA about keyless ignitions on Facebook. I've been trying to figure out the connection since. I assume they were saying that he started his car and went to do something with the gate, not realizing the car was in Neutral or Drive? But you can't turn the car off without it being in Park, even with a keyless ignition, right? I don't do the ISWG posts, but I love reading them and enjoying the various answers to the same question. It's a great idea for the group. I think it's such a great idea to add the monthly question to the IWSG posts. You guys rock as usual! Did you read about how people were freaking out saying they came home to haunted houses after watching the Conjuring movie? It must be one heck of a scary movie! I scare so easily I know I'd never make it through it. Thanks for the shout-out, Alex. I enjoyed Finding Nemo, so I guess I'll like Finding Dory. It would have been nice if they'd stretched their creativity to come up with new and different elements. Looking forward to the IWSG question. Oh no, how sad. I loved Anton Yelchin role as Chekov in the new Star Trek. He had such a promising career. I enjoyed watching him. He did such a wonderful job. Such a tragedy. Congrats all on the book releases. Very cool, having a IWSG question. Isn't that sad about Anton Yelchin? He was one of the only things about the new Star Trek movies that I liked. And I got a grand total of one of those trivia questions right! Dory was fun in Finding Nemo. Anxious to see her again. It is very sad about Anton. So young. I first saw him on tv 12 years ago, on Huff. Even then you could tell he was going to be a star. I'm so sad about Anton Yelchin. It's such a tragedy. Oh, The Conjuring 2. I haven't stopped thinking about the Crooked Man!! What a horrible accident that was for such a talented young actor. There are no words. Finding Dory looks really cute. Great bunch of books coming out! I like the IWSG idea! Really like the idea of watching The Conjuring. So sad to hear about Anton Yelchin - a talented man. I want to go see finding Dory so badly. UGH. If I could only find the time. I was so, sad to hear of Anton's death. He was a gifted actor and so, diverse. I was watching Charlie Bartlett-just the day before he passed. Sad! Off to check the IWSG-how wonderful! Good idea on the IWSG question. Hi Alex, I like the idea of the IWSG question. Looking forward to reading other writers' posts on that day. I was travelling and then from the last 3 days Internet was down, hence the late visit. I read about Anton. It's sad that he was taken so young. I heard The Conjuring 2 was doing well. Don't know if I'll go see it though. Looks spooky! You know the role I most loved Anton Yelchin in? Odd Thomas. Man, what a blow. We've been pretty sad about his passing. I saw Finding Dory with my kids. They loved it. Hank was the best character! I personally got a little annoyed with Dory's absentmindedness, but I thought the message was good. Nice to meet you Alex. Hubby loves to watch movies at home. Netflix or Amazon Prime. We've not been to a movie in years. Love the prompt for IWSG! And I haven't seen the new movies yet, and will have to budget my new book purchases this summer. My crazy kids have some big ideas about Olympic Hopes . . .
That was so sad about Anton Yelchin's death. :( He had a lot ahead of him. The Conjuring 2 is up my alley. I love horror. Congrats to all the wonderful authors with new releases. Especially Pat with #100. Doe! I said Robot World and I meant Westworld. I should have known the Spaceballs and Bill & Ted too. Oh well. I love the addition of the question. Though I'm still trying to think if there have been good comments given to me regarding my writing (outside of blog posts). And yes, I just learned Anton Yelchin passed away. So tragic. Stephanie, I'm not sure. From my understanding, there was a factory recall for that vehicle because it sometimes dropped from park into reverse. Karen, he got to you, didn't he? Sherry, they did drill that home, especially the scenes when she was young. Hello, Newman! I mean Sandra! Sorry, that just made me think Seinfeld. I love the IWSG question prompt idea! There are times when I feel like I'm just repeating myself with my insecurities, so that should help me branch out a little in those posts. And book 100, wow! Congrats to Pat Hatt! Hi, Alex! Sorry I'm just getting around now. I was locked out of my Google account because I sent too many emails in a row to one of my friends! I was sending her photos from her son's wedding, 9 photos to an email. I had no idea that could happen! Anyway, I like the new IWSG feature. It will be fun to read other members' responses. I already have a hard copy of Pat's new book, but I can't read it until I finish my long book on Rome. This week we had the outside of our house painted, our deck repainted, and have been tackling the bees that moved in ~ I am ready for some fun this weekend! Maybe we'll take in a movie! Very sad that Anton Yelchin was killed in that accident. Hope your weekend is great! It's so sad about Anton. Such a freak accident. Hubby was so sad about Anton being killed. Just a tragic death. I heard Finding Dory was cute but not a must see while it's in the theatre. One of my kids saw Conjuring 2 and now I want to see it. I heard there were some great jump scares in it. Will I get to the movies before it's gone? I'm not sure. Probably not, knowing me. 100 books for Pat. Does that guy ever stop? Congrats to everyone! Wow, there's a lot of news this week! Thanks for the movie reviews. You write such good and easy to understand ones. Congrats to Pat, JL, Rachel, Tamara, and Nicki on their new releases! Alex - You were the winner of my eBook giveaway from my guest post on writing injuries realistically on Sandra Ulbrich Almazan's blog. Please contact me at lisa@ljcohen.net for your choice of book. Congrats! I listened to commentary from Clyde Lewis on Ground Zero about 'Conjuring 2,' including tapes of the little girl who was possessed. I didn't originally want to see this movie, but now...? I hinted that I want to see it for my birthday. Pat Hatt has published 100 books! No way! Thanks for highlighting blogger books Alex! Just got home about an hour ago from seeing Finding Dory. I absolutely loved it! As a horror film connoisseur, I am really excited to see The Conjuring 2! Tim told me about this news. So young to go. I saw Finding Dory and loved it. Not at good as the first, but so worth seeing. I like this new question feature for the IWSG post. It does make it more interactive. Yep, I've finally got here. Good grief, the last film I saw at the movies was Close Encounters of the Third Kind. Nice to know my tribute site, IWSG, is revving up with fun and interactive action. There have been so many good things said about my writing that I cannot single out anything in particular. Fair enough, it's actually the dog there referring to. Cool new releases. I'm delighted that Pat in the Hatt has been released, um pleased to note this marks his 100th book! Thanks for noting those new releases. Really sad news about Anton. Such a young life ended. Fundy, sorry you got locked out of your account. Elsie, apparently Pat doesn't stop as he just released another book this week. Al, hope you get to see it. 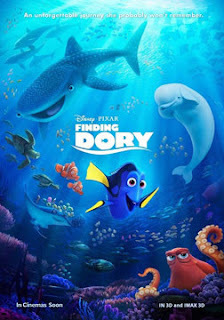 The plot is similar to Finding Nemo and many of the elements are repeated... And still everybody loves this movie. I wonder why. See, now I need to go and check it out too. That said, I hated ID2. I loved the FX but I felt cheated and my brain knocked on my skull and said it was being insulted. Great looks, mindless fun. A bit like that ex of mine. The question for the IWSG post is a great idea and will help those looking for inspiration. I read Pat's book, it's straight action! Great job! So it is Finding Dory in, and Independence Day out. I think you guys are doing a great job with the IWSG! Hi, Alex! I stopped by on Monday, but your post wasn't up yet. Another crazy week under my belt, but I think, hope, things are slowing down now! This morning it is softly raining here, and I am seizing the moment to try and catch up on visiting my blogging buddies. Thanks for the heads up on ID:R. I'll definitely pass. I am looking forward to the new Star Trek! Pat has another book out! He is something else. I've just started his murder mystery and am looking forward to a fun read. Have a wonderful 4th of July! Thank you for the shout out, ninja! I really appreciate it. Dragon Hugs!